Every artist eventually finds a pencil they like best. Most of these pencils are similar, but once you’ve been drawing & doing traditional work for a while you’ll notice subtle differences between brands. Let me start by saying that basically every brand of art pencils can work well. There isn’t really a “best” art pencil—but there is probably a brand that you’ll feel works best for you. The Staedtler Lumograph 2B pencil is perfect for all types of drawing from quick sketches to finished pieces and everything inbetween. 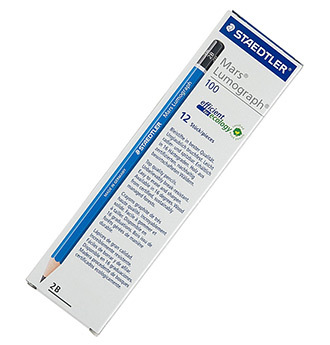 My personal recommendation is the Staedtler Mars Lumograph, specifically the 2B pencil. It’s got a great feel and it doesn’t leave marks that are too dark, nor too light(definitely on the darker side though). It works with newsprint, sketchbooks, and basic printer paper. It’s great for beginners and pros alike. It’s my preferred art pencil that can fit with everything. But let’s take a deeper look at this pencil(and some others) to help you find one to call your own. Let’s start with my personal choice and it’s the one I recommend for every artist who isn’t sure where to start. The Staedtler Lumograph 2B pencil is a very safe bet since it can leave strong marks and it can get pretty sharp. All the Lumograph’s are noticeable since they come in a light shade of blue with a black tip. They all feel similar in your hand but the lead grade varies widely. With this pencil the difference between a 2B and a 2H is like night and day. If you’re finicky you could try an HB instead. But personally I think most artists go too light with their traditional drawings, rather than too dark. If you typically make lighter marks by default then you’ll want a softer lead like 2B. 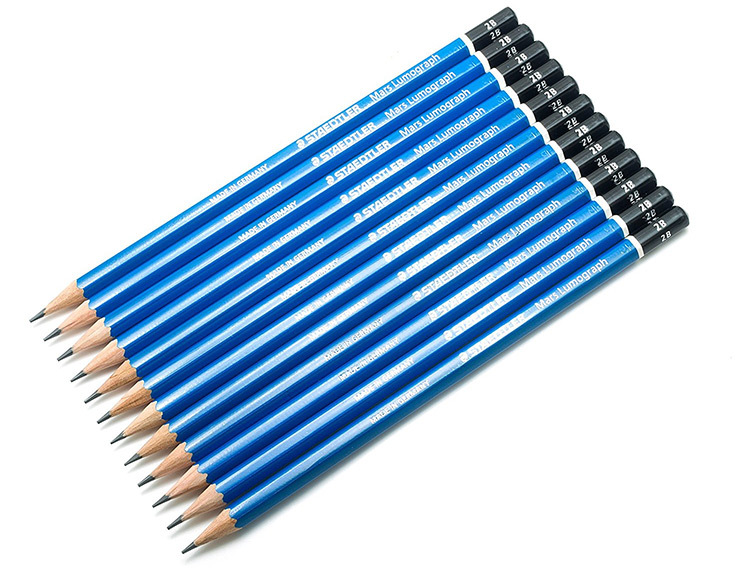 One nice thing about Staedtler is that these pencils are designed to be break-resistant. You’ll usually find this in most art pencils, but I’ve found the Lumographs break far less often&emdash;even when sharpened to a super fine point. At the end of the day this is really just a pencil. You can’t go wrong with any of these choices. I find the Lumograph really easy to work with. The blue outer coat is a nice aesthetic touch as well. And since artists appreciate beauty it’s safe to say we care how our pencils look! Bottom Line: The Lumograph is great for any artist of any skill level, especially for people who just don’t know what they’re looking for in a pencil. It’s makes dark lines with a great softness for people who have a lighter touch while drawing. Also affordable in bulk so it’s a great pencil to start your artistic journey. Here’s one brand I certainly like and recommend for lots of art supplies beyond pencils. I know a lot of artists who swear by Faber-Castell. 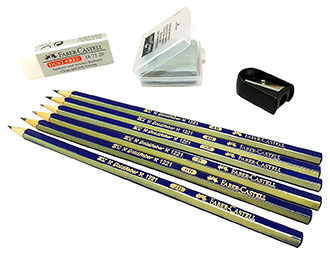 In fact, Faber-Castell was the very first brand of pencil I ever used when I started drawing. Have a look at this pencil collection and see what you think. If you’re looking for a pencil to draw with consistently I recommend buying the entire pack of Faber-Castells with all their hardness levels(2H-6B). This gives you a ton of variety to play with. You may find that in your sketchbook you prefer the HB pencil, but working on cheap printer paper you like the 2B. This is a common occurrence for artists who switch between many papers & mediums. Not much to lose with this set and you’ll have a bunch of lead styles to test out. Bottom Line: Faber-Castell makes great art supplies and these pencils are no exception. Easy to draw with, clean marks, and easy to sharpen to a fine point. The best part of this pencil set is the variety of lead styles. The Conte 1710-2B is a pencil I had never heard of before Proko. 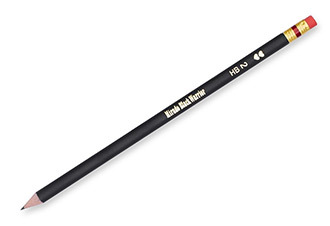 He mentions this pencil by name in his figure course and has this listed on his art supplies page. Let me say this pencil feels very different than most graphite pencils. It’s much easier to spread around the page so it’s almost like you’re painting with values. The lead is also very thick and super dark. Darker than a 2B usually is. So why’s this pencil so great? Well it’s definitely got a unique feeling while drawing. You can use it for lots professional finished work from portrait drawings to more detailed life sketches. I also like this pencil for mimicking Proko’s style. I’ve reviewed a lot of his courses and he uses the same pencil in all of them. Granted he follows a classic atelier style of sharpening his pencil and you may not wanna bother with that. You can still sharpen this pencil with a regular pencil sharpener no problem. It’s just going to draw a little differently compared to Proko’s videos. If you’re following any of the Proko courses then you might pick up a Conte 1710 and see what you think. Just note this pencil is pricey. One Conte 1710 may set you back about the same as a box of 12 Staedtlers. But as with most things in life, you get what you pay for. It’s just a question of whether this pencil is something you want. Bottom Line: The Conte 1710 2B has very unique lead that leaves smooth marks almost like charcoal. This pencil is Stan Prokopenko’s exclusive choice for all his Proko videos too—partly because it offers a lot of versatility between sketching, portraits, and life studies. Biggest downside is the price tag. If you want a pencil with a thicker point while drawing then check out these Derwent drawing pencils. They look & feel just like any other graphite pencil, although to me they do feel a bit heavier. Nothing that’ll get in the way of your work at all. Usually once you start using a pencil regularly you get used to the weight & size. I also like this pack because it offers variety packs. You can choose between packs of 4, 12, or 20 pencils. Lead softness ranges from 4H to 6B and even includes the mysterious F lead grade. If you aren’t sure which lead to use I personally like the HB, although I haven’t used the 2B much so I can’t compare. Whenever I sharpen these pencils I always find that the lead feels a bit “fuller” than other pencils. Meaning that you can expose more of it quickly and it’ll end up a bit thicker once the point wears down. Similar to the Conte 1710 but not as big. If you like to draw with a mix of thick & thin lines then try these Derwents on for size. Bottom Line: Great pencil for drawing with lead that’s super easy to expose. You can sharpen to a fine point or keep it somewhat flat to vary your line styles. And Derwent offers 8 different softness levels for you to play with. I’d describe the Prismacolor Ebony graphite pencil as smoother than velvet. This lays down dark lines with ease and it feels almost luxurious(for lack of a better term). Each mark feels so smooth and blends into every type of paper I’ve used. This makes it easier to blend than most other graphite pencils and it comes close to the Conte 1710. You can use this for everything from quick sketching in your sketchbook to more detailed projects like drawing your own 2D comics. My biggest pain point: Prismacolors are a wax-based pencil so the lead will break easily with too much pressure. One accidental drop on the floor and you’ll be reaching for your pencil sharpener. Unfortunately most pencil sharpeners are too rough and will even break this lead while sharpening! The solution? Grab a Prismacolor sharpener along with this pencil set. It’s got a very light touch and you’ll never worry about breaking your lead. It’s the perfect companion for such a smooth pencil and it’s a sharpener you can use with every type of pencil, not just Prismacolors. 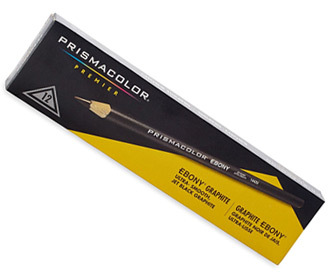 Bottom Line: Rich, free flowing lines define Prismacolor’s Ebony pencil for drwaing. It offers a smooth charcoal-style feel that you rarely find in graphite. But the lead is easy to break so I recommend grabbing a Prismacolor sharpener since it’s much lighter on the lead while sharpening. I have to include this pencil in my list because I get so many recommendations for it. Personally, I can’t see what all the fuss is about. But from my art friends who use the Mirado Black Warrior they absolutely swear by it. Of course, it’s a good pencil. I wouldn’t have it here if it sucked! It’s easy to draw with, makes crisp lines, super lightweight and easy to use. However one thing to note is that the Black Warrior only comes in the HB softness. When I used this for some sketching I didn’t notice much of a difference in darkness compared to other pencils. For HB lead this still makes dark marks. Certainly a unique choice and I’ve heard mostly glowing opinions from people who use this. Give it a shot if you’re curious. Bottom Line: Try this out if you wanna mix up your pencil stash. It’s very affordable even in bulk and this art pencil doubles nicely as an office pencil for taking notes. Odds are you’ll either love this pencil or think it’s kinda “meh”. Most artists use graphite for drawing because it’s easier to erase and doesn’t smudge so much. But with charcoal you can work more painterly and smooth your values with broad strokes. If you’re looking for recommendations on the best charcoal pencil I vote for the Royal & Langnickel set. 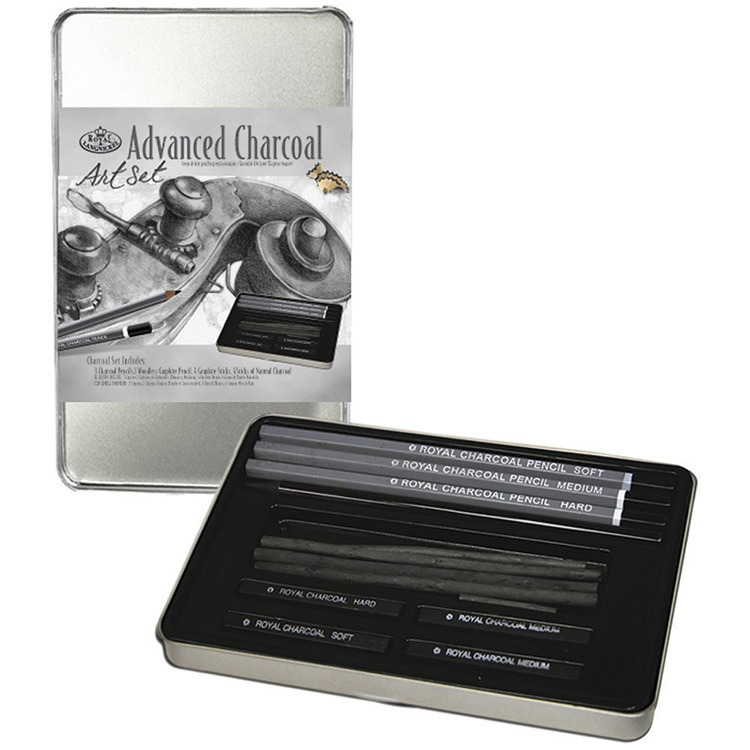 This charcoal pencil set comes with a variety of styles offering plenty of room to test your skills. And it’s pretty affordable too! This comes as a whole set of charcoal so you’re not just buying one pencil. In fact you’re getting all three types of charcoal in this one set. I have not used the woodless pencil but I’ve heard great things about this brand from many art friends. My personal experience with charcoal is that these sticks are fantastic. 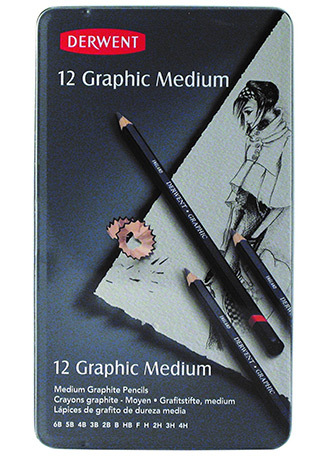 I’ve mostly used the charcoal pencils and this brand is easy to sharpen + easy to play with using different techniques(overhand, cross-hatching, brushes). I’m certain the regular charcoal sticks are also superb. This pack has absolutely everything a beginner needs to start learning and ultimately master charcoal drawing. Plus this is great for experienced artists who might wanna try different types of charcoal, or different levels of softness with charcoal pencils. There is no absolute best art pencil. It all comes down to personal taste and some artists just prefer different brands. The best thing you can do is try a lot and find a pencil you really like. You’ll want to test the brand of pencil along with the softness of the lead. Find the best combo that works for you. To me the best pencil for drawing is the Staedtler 2B Lumograph hands down. It’s got a nice softness to the lead, soft but not easily breakable. It’s lightweight and when you’re drawing it seems to last forever between sharpens. Although if you take enough time searching I guarantee you’ll find someone who thinks otherwise. It all comes down to personal opinion and what you’ve experienced with different pencils. My advice: try a few pencils and see for yourself. Pick 2 or 3 brands you’d like to test. Save the drawings you do and make a note of which pencil you used for each one. Rotate through pencils during your regular practice time and find a pencil you really like.Then stick with it and make some awesome art.